Accompanied by some of his “Star Trek” colleagues, actor and writer Walter Koenig received a star on the Hollywood Walk of Fame on Monday. Koenig played Ensign Pavel Chekov on the original series, which ran from 1966 to 1969, and in seven feature films. 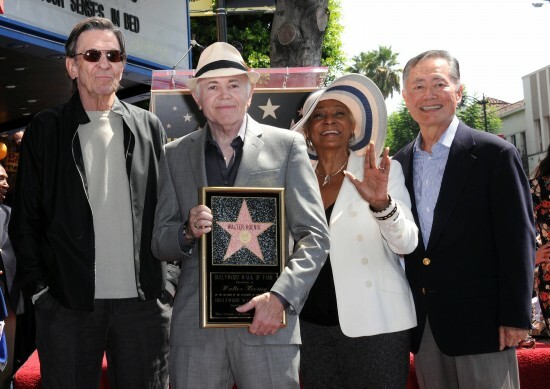 Among those attending the ceremony on Hollywood Boulevard were actors Leonard Nimoy (Spock), Nichelle Nichols (Uhura) and George Takei (Sulu). Koenig is the last original “Star Trek” cast member to get a star. His star is near Takei’s, which was unveiled in 1986. Nichols, Nimoy, William Shatner (Capt. Kirk), the late DeForest Kelley (Dr. McCoy) and the late James Doohan (Scotty) have also received the honor. Other special guests included actors Garrett Wang and Tim Russ from “Star Trek: Voyager,” Chase Masterson from “Star Trek: Deep Space Nine,” Herb Jefferson from the original “Battlestar Galactica,” and Jamie Farr from “MASH,” and Rod Roddenberry, son of the late “Star Trek” creator Gene Roddenberry, who also has a star on the Walk of Fame. The ceremony came two days after the 46th anniversary of the premiere of “Star Trek” on NBC. Koenig joined the show in its second season. Takei has remained close to Koenig and Nichols, who served as his best man and maid of honor when he married Brad Altman in 2008 at the Japanese American National Museum. “He has lived long and prospered,” Takei said of Koenig in a congratulatory message posted on Facebook.